It is New Year’s Day. From western Virginia, Capt. 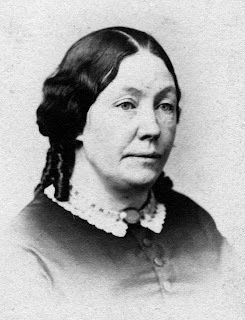 Tom Taylor of the 47th Ohio sends his wife, Netta, a picture of himself as a “New Year’s gift.” Also in western Virginia, Lt. Col. Rutherford B. Hayes of the 23rd Ohio is his usual cheery self, noting the weather was windy and threatening “as if a storm were brewing, but no rain or snow. I set it down as a pleasant day.” In Kentucky, Col. William B. Hazen prepares to take command of a brigade—6 regiments—as well as his own regiment, the 41st Ohio. Elsewhere, it is business as usual for Brig. Gen. Ulysses S. Grant at his headquarters in Cairo, Illinois. He wrestles with problems with army bread, writes an order regarding transport of sick soldiers to and from a hospital, and wonders how to handle with “delicacy” a change of staff in his quartermaster’s department. And at Benton Barracks, St. Louis, Brig. 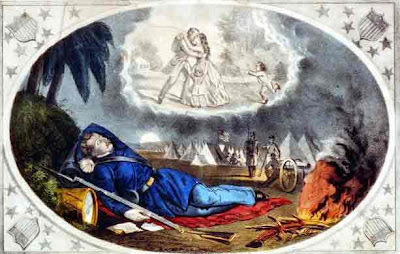 Gen. William Tecumseh Sherman is suffering the miseries of the damned as he thinks back to the emotional flame-out in Kentucky which caused him to relinquish command. I am here in a subordinate place whilst others occupy posts I ought to. I cannot claim them for having so signally failed in Kentucky and here I could not demand a higher place….The idea of having brought disgrace on all associated with me is so horrible to contemplate that I cannot really endure it. I am so sensible now of my disgrace from having exaggerated the force of our enemy in Kentucky that I do think I should have committed suicide were it not for my children. How can Cump and his military career be saved? The happiest man in western Virginia must be Lt. Col. Rutherford B. Hayes of the 23rd Ohio, now in winter quarters at Camp Union in Fayetteville. Hayes is a man with a warm, engaging personality, a perennial optimist who enjoys life wherever he finds it. A lovely day today. Twenty-six fine days this month; a few [of] them cold, not severely so, but all good weather. Lucy getting on well. Others might not agree. Gloom has settled on the North. Having embarked on war with high hopes for glory and quick victories, the Union side has suffered one humiliation after another: the capitulation of Fort Sumter, the embarrassing rout at Bull Run, the shocking disaster at Ball’s Bluff, and, to top it off, the puzzling lethargy of Maj. Gen. George B. McClellan and Army of the Potomac, a highly polished force that seems to be going nowhere. These failings occurred in the Eastern Theater and were highly visible. Getting far less attention was Western Theater success in dominating most of western Virginia And there were encouraging signs of initiative in southeastern Missouri and western Kentucky by Brig. Gen. Ulysses S. Grant, a promising man of action. Grant is an unknown, so Easterners aren't paying a lot of attention. In Washington, President Abraham Lincoln quietly labors away, besieged by critics from the left and right, as frustrated as everyone else, but never giving up. Among Lincoln’s difficult partners is the Congressional Joint Committee on the Conduct of the War (CCW), a group of Radical Republicans who want hard, swift action against the Confederacy. Lincoln spends an hour and a half conferring with the CCW, then writes General McClellan an encouraging note because the committee’s doings “give you some uneasiness.” McClellan is right to be uneasy and so is Lincoln, but the President is determined—for now—to be supportive of the general-in-chief of Union forces. Because General McClellan is ill, Lincoln steps into army affairs to wire Generals Henry W. Halleck, commander of the Department of the Missouri, and Don Carlos Buell, commander of the department of the Ohio: “Are you in concert?” These close neighbors in command are not, a problem that will not be solved until the Western theater is given unified leadership. The weary Lincoln ends the day by listening to serenades from four bands. We can only hope the music was soothing. A graduate of Ohio’s Oberlin College, Cox was a lawyer well read in military literature, fluent in French, a good horseman, and a fine fencer. 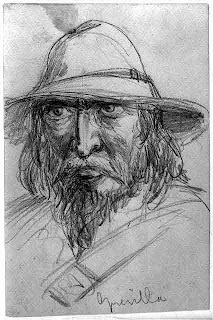 Author Fletcher Pratt wrote that Cox was “world famous as an authority on microscopy and cathedral architecture, [as well as being a fine writer], politician, soldier, artist—everything.” To top it off, the slim, six-foot-tall Cox was 21st-century handsome, fine featured, with a clear, unwavering gaze that practically demanded you trust him. Which many people did. At the outbreak of war, Cox was an Ohio state senator who promptly won one of only three brigadier generalships allotted Ohio. It wasn’t long until the 33-year-old Cox was commanding the “District of the Kanawha” and its three brigades. This was the region in western Virginia to which Rutherford Hayes’ 23rd Ohio is assigned. During the winter of 1861-1862, the Northern public and many soldiers grouse over the apparent lack of action. Instead of leading men into combat, however, many officers are using the winter to tune up their forces, much of the effort going into what Cox called “the work of sifting the material for an army.” A backlog of courts-martial is being cleared up, unsuitable officers are being demoted or dismissed, and bad actors in the ranks are being sent home. Writing years later about this period of the war, Cox came to some interesting conclusions. First, “the volunteers were always better men, man for man, than the average of those recruited for the regular army,” he said. According to Cox, this was because volunteers were moved by “patriotic zeal” and a need for “self-respect,” while regulars tended to be the dregs of society, “outcasts, to whom life had been a failure,” men to whom the army is a last resort. Cox, of course, was describing western troops, whom he knew best, and what he said applied especially to them: western volunteers followed orders when they believed in what they were doing. An attempt by a foolish officer to treat them unfairly or to force them to do something that didn’t make sense was apt to fail. The best officers in the western armies are respected or even loved, while bad officers risk rebellion in the ranks. It might be said that western officers governed with the consent of the governed. There’s something very American about that. At Camp Chase outside Columbus today, a man who is having one love affair and beginning another writes his wife, Caroline, at their home in Millersburg, Ohio. The writer is Marcus M. Spiegel, a man passionately in love with Caroline, who he had met and married eight years earlier. 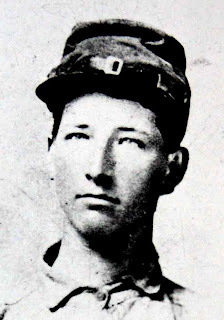 But Spiegel (pictured here), who is captain of Company C in the newly formed 67th Ohio Volunteer Infantry, is also falling in love with army life. “My dear & much beloved wife and children!” Spiegel practically shouts at the beginning of his letter (For clarity, most of the spelling and syntax in these excerpts have been changed.). “Here we have barracks large and commodious….My quarters are prepared with [a] bunk also & [are] as warm as can be….If I could only see you and the children once a day, I would feel as happy as I could wish. Spiegel ends by urging his wife not to worry, a soldier’s typical words that are typically ignored. “Farewell, my loves, & remember your ever-loving husband & father,” he concludes. Spiegel is a Jew in an age of open anti-Semitism, although his winning personality seems to have spared him much of the usual hostility. Still, the feeling is there, if not always spoken. Moreover, Spiegel’s work as a wholesale merchant in Holmes County had not spared him “pecuniary troubles…for the last 3 years.” So the army offers Spiegel a new opportunity to achieve success and esteem. Eventually, Spiegel’s new love affair will affect his first one. Actions—especially those in war—have consequences. Col. Marcus Spiegel’s picture appears here through the generosity of his great-great granddaughter, Jean Powers Soman. Colonel and Caroline Spiegel’s story is told in full in A Jewish Colonel in the Civil War, the colonel’s letters edited by Mrs. Soman and Frank L. Byrne. OTHER OHIOANS TODAY: From Camp Union, Fayetteville, western Virginia, Lt. Col. Rutherford B. Hayes: of the 23rd Ohio bombards Lucy with rhetorical questions about their newborn son, not yet named, “Does the ‘face of the boy’ indicate the heart of the boy’? Do you love him as much as the others? Do you feel sorry the fourth [son] was not a daughter?” We do not know how Lucy answered, but we can guess. Also from Camp Union, Col. Eliakim Scammon’s expedition of 5 companies—about half a regiment—marches 25 miles south from Fayetteville to Raleigh (now Beckley), hoping to surprise a camp of sick Confederates further down the road. So far, the Federals have met no opposition nor surprised any Confederates. So it goes. From Camp Jefferson in Kentucky, Robert Caldwell of the 21st Ohio, Company I, cheerily writes his mother in Elmore, Ohio, that “We live top top.” The dutiful son assures his mother that his tent and the area around it “are thoroughly policed every morning” for cleanliness and that his company has a wonderful cook, a Mr. Barnes. Caldwell claims the company cook is skillful enough to work in a restaurant, making him a rarity among army cooks. Another member of the 21st Ohio is less chipper. Alfred D. Searles, one of two brothers from Fulton County, Ohio, who are enrolled in Company H, complains to his family, “Here in camp…they is so many men and they hurried here by the thousands and the tens of thousands all expecting to be led on to battle and now within a few miles of the enemy we are stopped and commanded to lay here for near 3 months and not a man of us even to our colonels can solve the mystery or even guess what the meaning may be.” Innocent young men like Searles cannot guess what is coming. Before the war is over, the 21st will have seen all the combat it could ever want, and more. Creating the mystery in Searles’ mind is Brig. Gen. Don Carlos Buell, commander of the Army of the Ohio. Washington is urging Buell to action, but the slow, stubborn general is secretly waiting for spring so he can attack Nashville and East Tennessee on his own schedule and in his own way. Buell does not realize he has less than a year to prove himself. ELSEWHERE IN THE CIVIL WAR: Brig. Gen. Ulysses S. Grant has returned from inspecting the troops under his command in the District of Cairo. 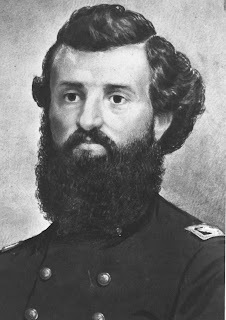 Grant ordered some tweaking of troop locations, found many loyalist refugees living in a cave, and gathered intelligence about the number and disposition of Confederates in western Kentucky. Grant informs Union command in St. Louis that he also has a spy in Columbus, Kentucky, busily mapping Confederate earthworks and eavesdropping on enemy conversations. 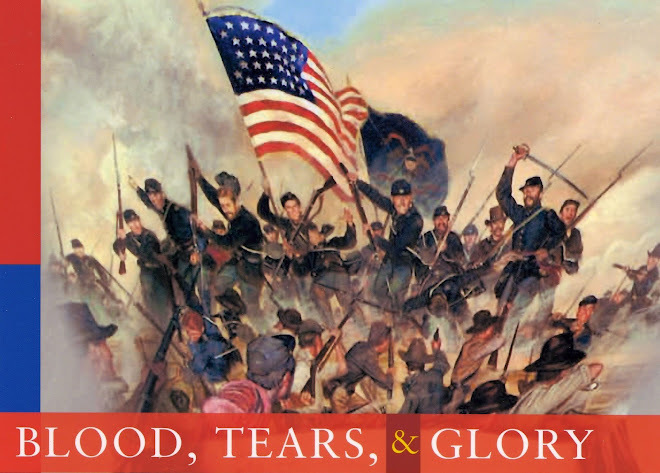 DON'T FORGET: April 12, 2011 marks the 150th anniversary of the outbreak of the Civil War. That's less than 3 1/2 years from now! Since Thursday, Brig. Gen. Ulysses S. Grant (pictured here) has been in the field, inspecting his troops wherever they are in the Military District of Cairo. In his absence, Capt. John A. Rawlins, Grant’s assistant adjutant general (and most important staff officer), issues “General Order No. 26,” which the general had previously signed. Grant’s order declares that all displaced citizens loyal to the United States, who have been driven into Grant’s territory from their homes in southwest Missouri, shall be “comfortably supported” by Union authorities. Although the Federals occupy the northern two-thirds of Missouri, Confederate regulars under Sterling Price and irregulars under such desperadoes as William Quantrill are making life hard for Union loyalists in the southern third of the state. The order does not say exactly how loyalists are to be accommodated, so local commanders are on their own in figuring out how to provide shelter and support for the unfortunate loyalists. However, higher authority than Grant—namely, Maj. Gen. Henry W. Halleck, Grant’s superior—has figured out how to pay for whatever local commanders need. Again, just how this will be done is left unsaid. So goes the administration of justice and the solving of social problems in this early stage of the Civil War in Missouri. PLEASE REMEMBER: Observance of the 150th anniversary of the Civil War begins in 2011...fewer than four years away! During the war’s winter hiatus, many soldiers complain there is nothing to do but “drill, eat, and sleep.” For the officers, however, it’s not that simple. Trying to keep order and maintain morale among thousands of energetic young men who are homesick, bored, and restless is a constant challenge. At Camp John McLean near Cincinnati, the 75th Ohio has been slow to fill its ranks. Higher authority has decided to speed things up by merging another partially filled regiment—the 79th Ohio—into the 75th. The men of the 79th come from the vicinity of Athens and the coal-mining region of southeastern Ohio. Like many other Civil War regiments drawn from distinct regions, they have a strong sense of their own identity and oppose losing it to the 75th. Sgt. Oscar D. Ladley of the 75th writes his family that the angry men taken from the 79th threatened to return home. “They seem dissatisfied since they came down here and threatened to leave last night whether or no, and if we attempted to stop them, they would ‘clean us out’ and then go,” Ladley writes his mother and sisters. At Camp Union, Fayetteville, western Virginia, Lt. Col. Rutherford B. Hayes has a different problem with some men of the 23rd Ohio. A disagreement arising from gambling arises. 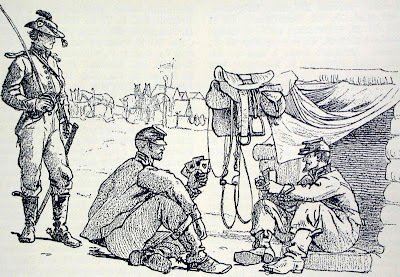 (Pictured above: “Gambling in Camp,” by Winslow Homer) Two men from Company C complain two other men misled them. Hayes shows the complainers no sympathy, saying they had allowed themselves to be misused as “stool-pigeons” (he means “decoys”), but he orders the other two men to contribute their ill-gotten gains to the Company C common fund. “It will be used to buy gloves and such other comforts as the Government does not furnish for all the company,” the Solomon-like Hayes pronounces. IN NATIONAL NEWS: American pick up their newspapers to learn that Confederate envoys Mason and Slidell, forcibly removed from a British ship by the Union navy, are being freed. That defuses an escalating crisis between the Lincoln Administration and Great Britain—much to the disappointment of the Confederacy, which had been hoping the Union would be forced into a two-front war. At Camp Union in Fayetteville, western Virginia, Lt. Col. Rutherford B. Hayes writes in his diary about Colonel Scammon’s plans. Scammon, commander of the 23rd Ohio, has come up with the idea of sending an expedition nearly 70 miles over muddy roads to surprise and capture an enemy camp of 600 sick men guarded by about a hundred Confederate soldiers. Already thinking like a tactician, the unblooded Hayes has his doubts about Scammon: “He does not seem willing to look the difficulties in the face, and to prepare to meet them.” Another problem: despite the prevailing Unionist sentiment in western Virginia, there are still plenty of Confederate sympathizers lurking in the hills and valleys, so n“surprising” the enemy will be quite a trick indeed. From Cairo, Illinois, Brig. 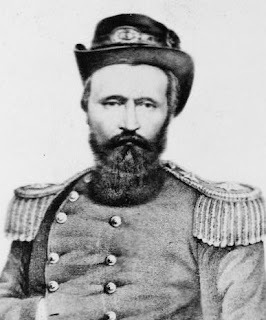 Gen. Ulysses S. Grant, (commander of the District of Southeast Missouri, now called the Department of Cairo) writes Brig. Gen. Don Carlos Buell in Louisville, Kentucky (commander of the Department of the Ohio), describing the boundaries of his own command and asking for a clarification of Buell’s. Grant commands the military in southern Illinois, southeastern Missouri, and Kentucky west of the Cumberland River, while Buell is responsible for the territory east of the Cumberland. The division of the Western Theater into multiple commands will cause problems until a single commander is put in charge of it all--a clear case of "too many cooks spoiling the broth." Remedying this will not happen any time soon. Hayes dines in the sergeants’ mess of one of the companies of the 23rd Ohio, sharing in “an eighteen-pound turkey, chickens, pies, pudding, doughnuts, cake, cheese, butter, coffee, and milk, all abundant and of good quality.” Later, in his own quarters, Hayes entertains a dozen officers with oysters and crackers, and retires at 11 p.m.
Cpl. Robert H. Caldwell and the 21st Ohio in Kentucky are given Christmas Day as a holiday, free to visit brother soldiers in neighboring camps or explore local curiosities. Caldwell and another soldier elect to explore a large cave about a mile from camp. They spent most of the day investigating the cave’s many rooms, sometimes crawling on their hands and knees, returning to camp “well satisfied” with their excursion. THE BIG PICTURE: Lincoln’s Cabinet spends four hours, from 10 1.m. to 2 p.m., discussing what to do about the Trent affair. That evening, President Lincoln entertains a number of guests for Christmas dinner, advising one of them afterwards that the Trent affair has been settled satisfactorily. It is Christmas Eve and across the nation tens of thousands of families must face a Christmas with fathers, sons, husbands, and brothers absent. In army camps, cooks are preparing—in some cases, with limited resources—for a holiday dinner on the morrow. And, at Benton Barracks nears St. Louis, Brig. Gen. William Tecumseh Sherman ponders recent events and shares his thoughts. To his foster father, Sen. Thomas Ewing in Washington, Sherman candidly admits, “I was convinced in Kentucky that I could not guide events, that I either grossly misapprehended them or was unprepared to lead in them. To guide I had not the faith that would inspire success.” He rejects his foster father’s advice to bring a libel suit against the newspapers, preferring to remain silent. He finds no fault with the Lincoln administration’s conduct of the war, but thinks that fighting on Southern ground puts the Union at a great disadvantage. He also tells Senator Ewing that Maj. Gen. Halleck, his superior officer, has assigned him to duty at Benton Barracks where “a large body of men” await arming and training. (Pictured above: Indiana volunteers arrive at St. Louis.) Presumably, Halleck thinks a training camp is a place where his friend Sherman will not careen out of control. Cump will not get his wish. Wife and boy doing well. Stranger arrived Saturday, nine o’clock P.M.
Good! Very! I preferred a daughter, but in these times when women suffer so much, I am not sure but we ought to rejoice that are girls are boys. What shall I call him? Dearest: I am so happy to hear today by telegraph that…”mother and son are doing well.” Darling, I love you so much and have felt so anxious about you. The little fellow, I hope, is healthy and strong. It is best it was not a daughter. These are no times for women….Kiss the boy, yes, “all the boys” for me. The child will be named Joseph Thompson Hayes. He will live for only 19 months. I am so happy to hear today…that “mother and son are doing well.” Darling, I love you so much and have felt so anxious about you….Kiss the boy, yes, “all the boys” for me. Other happy notes go off immediately to Uncle Birchard and Rud’s brother-in-law, the doctor. This is a time for happiness in the Hayes family; the time for sorrow will come soon enough. THE BIG PICTURE: With Great Britain threatening action against the United States (and the Confederacy looking on gleefully), Secretary of State William H. Seward, Secretary of the Navy Gideon Wells, and Secretary of the Treasury Salmon P. Chase meet with President Lincoln at the White House to discuss the thorny Trent affair. Influential Massachusetts Sen. Charles Sumner, a Radical Republican, advises Lincoln to release Confederate envoys Slidell and Mason. Cpl. Robert Caldwell, 21, youngest son of William and Jane Caldwell of Elmore, Ohio, had worked in his father’s lumber mill before joining the 21st Ohio, now in Kentucky.. His older brother, William C., serves as a hospital steward with the 72nd Ohio and their only sister, Juliet, is a student at Oberlin College. On this Sunday, Corporal Caldwell and the 21st Ohio, part ofo Buell’s Army of the Ohio, are enduring a rainy day in camp near Leesville, Kentucky. The 21st Ohio is camped near the Louisville and Nashville Railroad, with eight other regiments within sight, all of which are protected by three batteries of artillery on a hill overlooking the camp. This is only one of many ways in which the young soldiers learn that army life is usually less than glamorous. THE BIG PICTURE: In Washington, all minds are on the headache du jour: what to do about the Navy’s capture of two Confederate envoys, removed forcibly from a British ship. Britain is furious and threatening war; the Confederacy is delighted at the Union’s discomfiture and is hoping war between the Union and Britain will, in fact, break out. Time is running out for a decision by the Lincoln administration as Britain’s deadline for a solution approaches. Louisville, Kentucky, is a beehive of Union activity. "Several thousand” Louisville women, reduced to poverty by the war, have been hired as seamstresses for government contractors to turn out blue uniforms. Other Louisville women, serving as volunteers, have in the past two weeks produced 2,370 articles of clothing, 1,630 articles of bedding, 95 “army bags,” 62 bottles of wine, and many other items for the soldiers. Buell and Sherman, both Ohio-born, are two very different men. Sherman is imaginative, lively, emotive and changeable, a man of big ideas and strong opinions; Buell is quiet, aloof, rigid, a master of details and a bureaucrat by temperament. There is one other difference: while Sherman blurted out that he needed 200,000 men to do the job in Kentucky, Buell carefully says he does not “need” more men, but he could use more to go on the offensive. Instead of Sherman’s blunt demands, Buell hints at what he could do if he only had the men. A master of the inter-office memorandum, Buell is not seriously planning the massive drive south rumored by the newspapers and desired by Washington. And something else: in today’s The New York Times, the paper’s correspondent in Louisville reports that Buell has 110,000 men and soon will have 120,000. Not so. Within two days, Buell will quietly report to Washington that he has 70,000, of which only 50,000 could be called “efficient.” Most of Buell's troops are from Ohio and Indiana. Most inhabitants have fled, perhaps because their sympathies lay with the South or because they feared the town would become a battleground. Although pro-Union sentiment dominate western Virginia, the region is also home to a number of Confederate sympathizers. Some of these wage guerilla warfare on the Union forces. Lt. Col. Rutherford B. Hayes of the 23rd Ohio records in his diary today that Camp Union shelters 1,430 men from the 23rd, 26th, and 30th Ohio infantry regiments, plus an artillery battery and a company of cavalry. 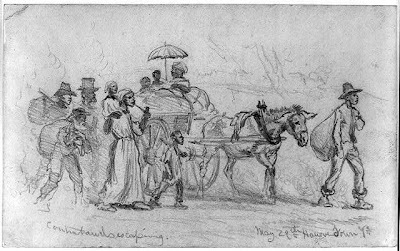 With this many men crammed into what was only a pretty little village, Fayetteville has become, in the words of one soldier, “muddy, dirty, [and] God-forsaken.” Trampled by hundreds of soldiers and escaped slaves, the streets are deep with mud. Trees and fences have been cut down for fuel. Abandoned by its rightful inhabitants, Fayetteville is forlorn looking place. On the other hand, no guerillas are operating in the immediate area and it is doubtful Confederate regulars will show up any time soon, so the Ohioans can look forward to a quiet, if boring, winter. It is much the same everywhere. Soldiers and civilians alike wait and wonder what is coming. Sometimes they creep furtively out of the woods and sometimes they walk boldly down the road; sometimes they come in groups and sometimes singly; but they all have the hunted look of men and women trying to get away from something. Despite Southerners’ claims of how well they treat slaves, slaves have been escaping northward for decades. Within weeks after the fall of Fort Sumter, they began showing up at the Virginia military base of Union Maj. Gen. Benjamin F. Butler. Butler put the escapees to work. He called them “contrabands,” because they had been assets to the Confederates and therefore subject to confiscation under the rules of war. But in these early days of the war the Lincoln administration is treading lightly on the issue of slavery and putting national reunion as its first priority. By degrees, Lincoln and the Congress begin freeing slaves, but until after the war emancipation will be a “work in progress,” rife with ambiguity. Escaped slaves are showing up at many Union army camps, where they get differing welcomes. Sometimes Union officers return slaves to their owners, trying to dampen secessionism. Many other officers, however, are unable to stomach slavery and harbor the runaways. With slightly less than full confidence in what he is doing, Hayes opines that the family is “entitled to freedom, as I understand the rule adopted by our government. The rule is, I believe that slaves coming to our lines, especially if owned by Rebels, are free.” Hayes is probably referring to the “Confiscation Act” passed by Congress on August 6, the first in a series of steps freeing certain slaves that will lead to Lincoln’s Emancipation Proclamation of January 1, 1863. ELSWHERE: Apart from a skirmish in Maryland—no casualties reported—all, is quiet on the front lines. In Cairo, Illinois, Brig. Gen. Ulysses S. Grant fires of a flurry of short, crisp dispatches on routine matters. St. Louis, Brig. Gen. William Tecumseh Sherman wonders what will become of him, now that he has returned to duty after his “rest break.” In Ohio, recruits drill at Camp Chase in Columbus and Camp Dennison, near Cincinnati, waiting for their regiments to fill and worrying that the war will be over before they can see some action. Oh, to be a general! Being a general in the Civil War was tough, dangerous work with very little job security. As the war went on, President Lincoln learned to not tolerate inaction or failure by commanders of the Army of the Potomac and that job took on a revolving-door quality. Very few men were temperamentally equipped to command a large army, anyway, and a West Point education and long service in the military was no guarantee of success. As Ulysses S. Grant and others will show us in days to come, leadership in war requires something innate that is hard to detect in advance. There is also something innate in the nature of a general’s daily work, and that is tedium. Most of a general’s days are spent shuffling paperwork, administering discipline to recalcitrant underlings, and keeping the wheels of an enormous machine oiled. I wish you could be here for a day or two to see what I have to go through from breakfast until 12 O Clock at night, seven days a week. I have just got through with my mail for to-night, and as its is not yet 12 and the mail does not close until that time, I will devote the remainder of the time in pening you a few lines. I have no war news to communicate however. Whilst I am writing several Galena gentlemen are in talking. They will remain until the office closes so you must excuse a disconnected letter…. Apparently, Grant was prompted to write this letter while trying simultaneously to entertain “several Galena gentlemen” because Mary had complained of a lack of mail from her brother. On this day alone, Grant’s other letters show he has to deal with the appointment of a Catholic chaplain, as a result of complaints from the 18th Illinois; information about the enemy brought in by a spy and a deserter; a pass for a soldier needing to go to St. Louis, an appointment related to management of railroad equipment, and an order for reports from a quartermaster. And in Washington: President Lincoln and his Cabinet try to figure out what to do about the embarrassing Trent affair, which has angered the British government and public. The Big Picture: Except for some Union scouting missions in Kansas, Missouri, and Virginia, all is quiet on the front lines. Both sides have shut down most military operations for the winter and are using the time to build up their armies. The United States remains split from East to West along almost exactly the same line it was in September. Will anything change in the next few months? And yet others are laboring on his behalf. 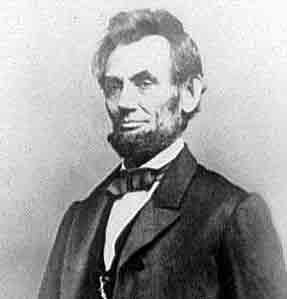 Brother John had discussed Cump during a long interview with President Lincoln and reported “the President felt kindly to him.” Ellen wrote a blistering letter to a Louisville newspaper that had copied the Commercial story and Ellen and John was able to persuade both the Louisville and Cincinnati papers to publish retractions. Brother Philemon Sherman had already written the Commecial to refute its claim, enclosing a letter from Halleck to that effect. In St. Louis, Halleck spoke reassuringly to Cump (while privately telling his wife “certainly he has acted insane”). For a West Point-trained warrior, William Tecumseh Sherman is off to a very bad start in this war. 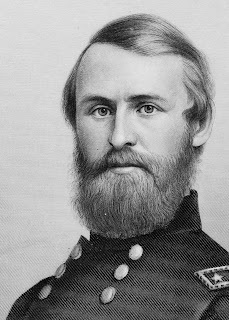 Lt. Col. Rutherford B. Hayes, whiling away the winter with his 23rd Ohio Volunteer Infantry in Fayetteville, western Virginia, writes a loving note to Lucy, his very pregnant wife, who is expecting to give birth any day now at their home in Cincinnati. 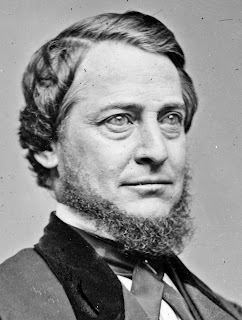 ELSEWHERE IN THE NEWS: The ever-perplexing Clement L. Vallandigham (pictured above), Congressman from Ohio, offers the House a resolution commending Capt. Charles Wilkes, captain of the Navy warship San Jacinto for capturing Confederate envoys Mason and Slidell. The Trent affair (named for the British ship from which the commissioners were forcibly removed, has infuriated the English and turned into a huge embarrassment for the United States. Right now, the U.S. government is discussing “at the highest level” (meaning Lincoln and his cabinet) how to get out of this mess. What on earth was Vallandigham thinking? Was he trying to cause mischief for the U.S.? Or was he, a bitter opponent of the war who nonetheless considered himself a patriot and opposed secession, sincere? In any case, the House quickly buries the resolution in committee. Early in September, two young farmers from Huron County in north central Ohio had travelled more than 50 miles to enlist for three years in the 21st Ohio Volunteer Infantry. The 21st was organizing in Findlay, a small town in northwest Ohio. Why they travelled so far from their own area to join a regiment of northwest Ohio men may have had to do with the reputation the 21st had established in its earlier incarnation as a three-month regiment. Instead of remaining in camp as some three-month regiments had, the 21st had seen some serious action in western Virginia, but lost only four men in battle. Re-born as a three-year regiment, it retained the same colonel (Jesse S. Norton) and lieutenant colonel (James M. Neibling) as before. To adventure-hungry young men, the “new” 21st sounded like a good outfit. The 21st was composed of men primarily from six northwestern Ohio counties, Hancock and Wood counties most of all. The two brothers from Huron County—Alfred Searles, 27, and Addison Searles, 21, were assigned to Company H, made up mostly of men from Wood and Seneca counties. One of the Wood County men was Liberty Warner (pictured above), another fresh-faced farm boy, who had joined over the misgivings of his parents. Warner’s letters home give a glimpse of life in the early days of the three-year version of the 21st. The regiment had filled quickly in Findlay during September, received its arms at Camp Dennison, near Cincinnati, on October 2, and--still green as grass--was rushed out the same day to Kentucky. In that disputed border state, Brig. 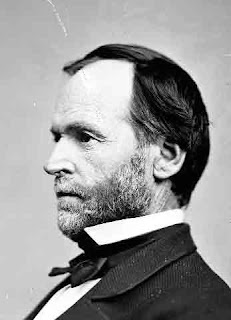 Gen. William Tecumseh Sherman was growing frantic over apprehensions the Confederates would attack and overwhelm him. We are within 8 miles of the rebels line and they hav [been] arond evry day. This 8 mils is won camp on both sides of the rode. 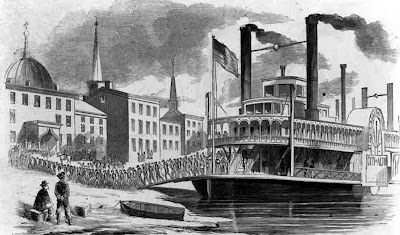 And for 2 or 3 mils behind us our trops is a crosing the Green River evry day and in a few days we shall go to see old Buckner [Confederate Brig. Gen. Simon B. Buckner]….and I no not who is to fall from our company, but I hop that it will be some of them. Ar commender Mitchel [Brig. Gen. Ormsby M. Mitchel, the “astronomer-soldier” from Cincinnati, commander of the 3rd Division of the Army of the Ohio, led by Brig. Gen. Don Carlos Buell, another Ohioan]…was here to make us a visit this evening. While on dress praid and he spoke a few words to us. He says that with the help of us and the help of God that he …must hav the best division in the hole union. We ma stay here fore days and we ma not stay 4 hours. This is all that we can tell of our life. We no not what moment we shall be cald upon to fight. Tho we bare it with pations, for we think God will help us to fight it through and we shall com out victorious in the end and come home to you all agane, if God is wiling that we should. Well, tell all to rite to me and father pleas escuse my bad spelling and rite soon. Good by all, if I hear I will rite to all agan. So good by to all of the children. In less than two years, Addison Searles will be dead. In less than three, both his brother Alfred and Liberty Warner will die as well. ELSEWHERE IN THE NEWS: President AbrahamLincoln reviews plans to connect Washington to forts as far south as Key West, Florida, by underwater cable. Secretary of State William H, Seward interrupts President Lincoln and friends at tea to report that Great Britain regards the Trent affair, in which a U.S. Navy ship stopped a British vessel and forcibly removed two Confederate envoys, to be a violation of international law. Rutherford B. Hayes, lieutenant colonel of the 23rd Volunteer Infantry, is a doting husband and father, and a successful lawyer in Cincinnati. He also is loving the life of a volunteer soldier in the mountains of western Virginia, faithfully recording in his diary every sunny morning, including today’s: “A fine day, warm and bright—the tenth [such day]!" Hayes’ sunny disposition—he almost sounds as if he wakes up singing—mayhelp the morale of some of his men, but must irritate others who are homesick and tired of snow, cold, and boredom. IN THE NEWS ELSEWHERE: Today, President Abraham Lincoln turns over to the Senate the documents it requested in the case of Col. Dixon S. Miles, alleged to have been drunk at the Battle of Bull Run. Although a military court of inquiry had found that a fellow officer was justified in calling Miles drunk, the court decided evidence was lacking for a court martial and, moreover, organizing the court would cause the Army “the greatest inconvenience at the present” and would “not be for the interests of the service.” With 21st Century hindsight, that was a very bad call. Slightly more than a year later, Miles’ inept defense of the Union position at Harpers Ferry will result in the largest surrender of U.S. troops in the war. Miles will be mortally wounded by an artillery shell, which some will say was fired by his own men, angry at his poor performance. Was all that in "the interests of the service"? With snow and cold gripping western Virginia, most of the Union troops stationed in outposts throughout the area huddle in their tents, crude huts, and commandeered houses and try to amuse themselves, feeling very put out at being shunted to the sidelines of the war. In reality, not very much is going on anywhere in the war, so in western Virginia the endless games of checkers, the carving of pipes and other knickknacks, and even an occasional “stag dance” must suffice for the bored soldiers. But not all. A 45-year-old Indiana brigadier general named Robert Huston Milroy (above, right)—a hard-nosed commander who is a bit of a loose cannon and known for declaring, “My will is absolute law”—decides he and his men have perched atop Cheat Mountain long enough and need to act like soldiers. With 1,900 men from Indiana, Ohio, and loyal western Virginia, he launches an attack at sunrise today on 1,200 Confederates perched on Alleghany Mountain (also known as Allegheny Mountain), about 20 miles away. The Confederate general is 45-year-old Edward Johnson, a Virginian who attended Kenyon College in Ohio (of all places!) before entering West Point (where he ran up scores of demerits before settling down). A genial man with a large stock of profanity, he was well-liked by his troops. 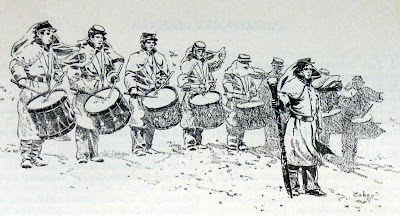 But Milroy’s attack, which takes place in bitter cold and gusty winds, is spoiled when Confederate picket guards detect his approach. Disorganization among the inexperienced Union troops makes things worse. Things get even worse than that when the Confederates open fire with their artillery; Milroy’s force had none. Finally, Milroy gives the whole thing up and retreats, licking his wounds (137 Union casualties, including 20 killed, to the Confederates' 146 casualties, including 25 killed). The Confederates do not follow, however, and historians generally regard the battle of Camp Alleghany as ending inconclusively. BUT at least some Midwesterners were trying to carrying the war to the enemy, and in difficult circumstances. 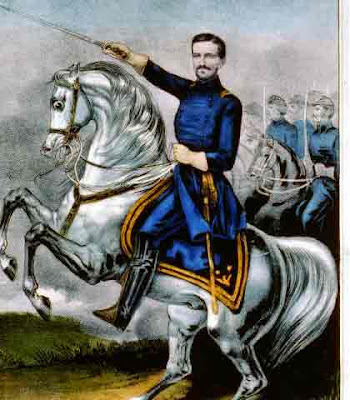 That was more than George B. McClellan was doing with his well-polished Army of the Potomac.